Louie Hena is a member of the Tesuque and Zuni Pueblos in New Mexico. He is a renowned permaculture design consultant, Rio Grande and Rio Chama river guide, and an educator on traditional land management systems. He helped organize the Traditional Native American Farmer Association, the New Mexico Acequia Association, and the Indigenous Food and Seed Sovereignty Alliance. 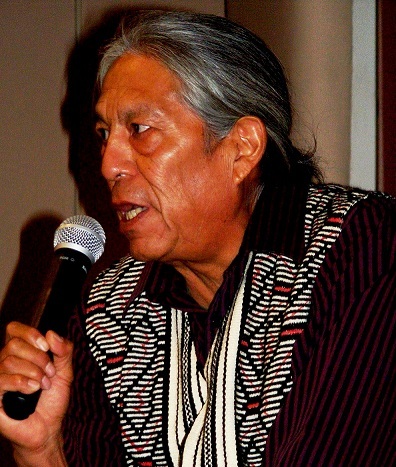 He has developed tribal environmental programs in several communities, represented New Mexico’s tribes vis-à-vis the EPA, developed the Native Cultures Feast and Float (a unique educational tourism experience), and is the co-author of A Tradition of Farming: Northern Rio Grande Pueblo Lessons of Land Stewardship and Sustainable Agriculture. Louie is adept at making the connection between local food and local energy, and, as a member of the tribal council for the Pueblo of Tesuque, Louie led energy initiatives that resulted in a solar system at the Taytsugeh Oweengeh Intergenerational Center at the Pueblo of Tesuque.